Micro Analog Systems Oy introduces piezoresistive sensor signal interface IC primarily intended for MEMS based pressure sensor modules. The device offers extremely low current consumption (down to 0.8 uA, one measurement in a second) which make it an ideal solution for battery powered and power critical applications. The heart of the IC comprises of a chopper amplifier with very low noise performance (0.27 uVrms) and delta-sigma analog-to-digital converter (ADC) with very high resolution (22-bit). 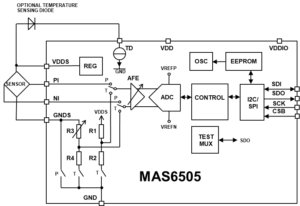 The MAS6505 can operate in very wide range of supply voltages (1.71 V…5.5 V) and over industrial temperature range (-40 °C…+90 °C). For temperature compensation purposes it supports two different temperature sensing methods; sensor bridge resistance sensing or using external temperature sensing diode. 512-bit EEPROM memory is available for storing sensor trimming and calibration coefficients on chip. The device is operated using standard I2C and SPI serial bus interfaces. Samples are available in die form and in QFN-24 4x4x0.85 package. For further information and samples, please contact Micro Analog Systems Oy at info-mas@mas-oy.com.